With a 707 inch screen diagonal, dnp Denmark has created to measure the largest display Supernova Infinity for WK Command Centre in China, whose content delivered three projectors Christie Roadster HD 20 K-J. The Danish manufacturer of optical projection screens DNP Denmark the largest display model Supernova Infinity, so far created in any facility in the world, designed for the WK Command Centre in China, whose name and complete location were not disclosed for security reasons. 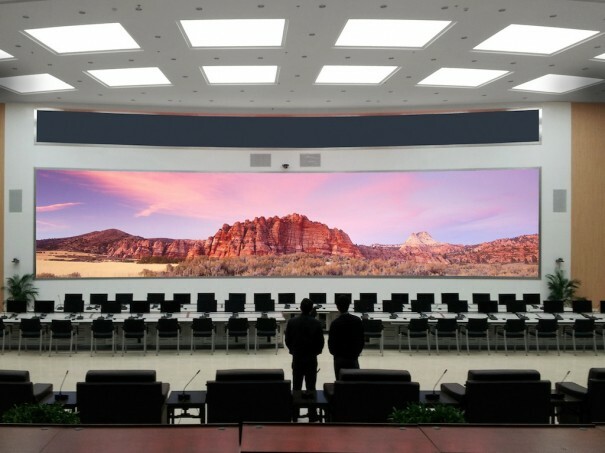 This huge Infinity Supernova, with dimensions of 3, 6 × 17, 6 meters and a 707 inch screen diagonal, has been installed by the dealer Wincomn Technology, partner of dnp in China. This multidisciplinary Centre has two rows of jobs for operators and has an auditorium with a capacity for 800 people, which is used for training and conferences. Wincomm solution consists of twenty-four Supernova Infinity screens, configuration of 3 × 8, which allows you to display content on up to 64 different windows, which delivered three projectors Christie Roadster HD 20 K-J. In the project, this Integrator has configured this spectacular Supernova slightly curved Infinity to ensure maximum visibility to all operators of the command center, regardless of your viewing angle and the distance from the screen. SuperNova Infinity is an advanced optical projection screen front modular designed by multiple units of Supernova screens which together form a huge and unique projection display, made up of seven layers of high-tech to offer a display of maximum quality and reliability. One layer is composed of an optical lens, patented by dnp, to reduce the impact of ambient light and achieve a better contrast of the image, as well as a reflection layer of high technology for maximum gain and color reproduction , among others. With an aluminium structure, Supernova Infinity is designed to avoid restrictions of size or number of screens, with a front projection with perfect color saturation and vibrant images without having to darken the room in which it is installed. The screens are easy and quick to join (in wall or ceiling) thanks to a series of high-powered magnets that achieve a virtually invisible union.